SANTA ROSA, Calif. – Award-winning design firm Think Tank Photo just released the App House 8 and the App House 10, two hybrid bags for quick access to a small or standard-size Apple tablets either as shoulder bags or mounted on belts. 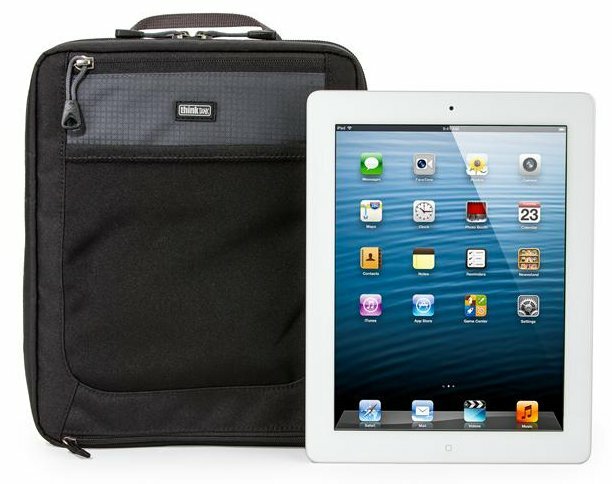 Streamlined and secure, their small size, removable shoulder strap, and double-lock belt-mount make it practically effortless for anyone to carry and access their tablet and stay connected around town or when traveling. Dedicated pockets for carrying a smart phone, device accessories, plus other small items. Premium materials: YKK® RC Fuse zippers, antique nickel-plated metal hardware and durable, long lasting, nylon fabric. A dedicated, easily accessible smart phone pocket with soft liner. An internal organizer with elastic and zippered pockets for connection cables, card readers, power cables, portable charger, pens, or other personal items. 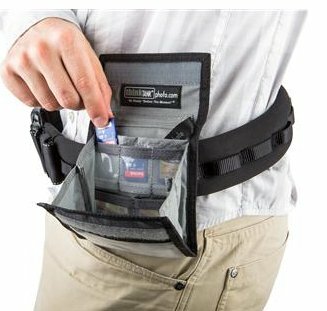 4-way stretch pocket on front for rapid access to lens caps, memory cards, batteries or other items. Removable and adjustable shoulder strap with non-slip pad. Double-lock belt attachment for added security. Grab-handle on top for quick pickup. Seam-sealed rain cover included in zippered compartment on bottom. Think Tank “No Rhetoric” Warranty…period. Exterior: For superior water-resistance, all exterior fabric has a durable water-repellant (DWR) coating, plus fabric underside is coated with polyurethane. These bags also have YKK® RC Fuse zippers, 250D shadow ripstop nylon, 420D high density nylon, 550D spun polyester, 200D polyester, antique nickel-plated metal hardware, 3-ply bonded nylon thread. Interior: 210D silver-toned nylon lining, nylex lined phone and tablet pockets, 150D hexa mesh pockets, 200D polyester, closed-cell antilon foam, 3-ply bonded nylon thread. SANTA ROSA, Calif. – Think Tank Photo’s new Modular Pixel Pocket Rocket (PPR) is belt-mountable. This enables photographers to easily whip out their CF and SD cards and to keep them securely and conveniently at hand when shooting. The Modular PPR is easily secured by a sturdy hook-and-loop panel to any Think Tank Photo modular belt or to any belt. It holds six CF cards and three SD cards, as well as other small accessories, such as a smart phone or lens cloth. Photographers can untuck the neck-strap from its own interior slot as a wearable option to show ID or credentials through the clear panel. Capacity: Holds 6 CF and 3 SD cards. Belt-mount option with double security attachment. Built-in neck-strap as a wearable option to readily show ID or business cards through a clear external pocket. Exterior: For superior water-resistance, all exterior fabric has a durable water-repellant (DWR) coating plus fabric underside has a polyurethane coating. It also has 250D shadow ripstop nylon and 3-ply bonded nylon thread. Interior: 210D silver-toned nylon lining, 3-ply bonded nylon thread. Headquartered in Santa Rosa, California, Think Tank Photo (www.thinktankphoto.com) is a group of designers focused on studying how people work and developing inventive new carrying solutions that meet their needs. They are dedicated to using only the highest quality materials and design principles, and employing materials that are environmentally benign. This entry was posted on Wednesday, March 5th, 2014 at 11:49 am	and is filed under News, Reviews, and Tips. You can follow any responses to this entry through the RSS 2.0 feed.